Wallpapers are materials that cover and decorate the interior walls. They are a part of the interior decor, and people nowadays are more inclined towards using them than being satisfied with just painting their walls. Nowadays there are many types, textures and applications of the wallpaper. 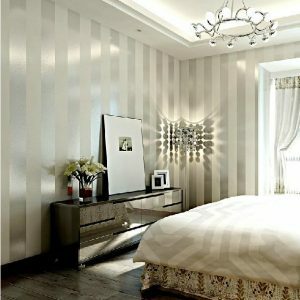 Among the most widely used in the market, vinyl wallpapers can be installed in any room. They comprise a design printed on paper or fibre and sealed off with a vinyl/plastic upper coat. Vinyl wallpapers have a little shiny look, are washable, easy to install, removable, light-resistant, cheaper and very durable. They can be used across all rooms, including kitchens and bathrooms which are more moisture prone. 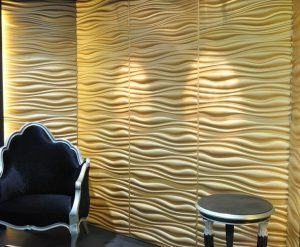 Vinyl wallpapers have a versatile range of colors and patterns, and can imitate wood, stone and metal. 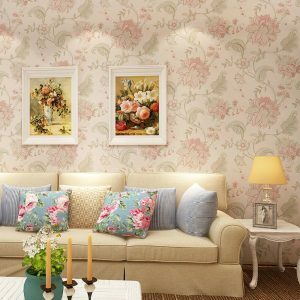 The most popular and frequently used type, traditional wallpaper is either single or double layered, has cellulose as it base and very ecology friendly. Since it is natural paper, these let walls breathe, are affordable and accessible and can be used in bedrooms and dining rooms. Unlike patterns printed on paper, embossing occurs when designs are pressed onto the paper backing thereby showcasing a raised textural effect. Embossed papers add a nice depth and contrast to plain walls. Texturing can range from delicate and detailed patterns to dramatic geometric ones. Cream and stone are often preferred textures since they complement the furniture and other decor accents seamlessly. 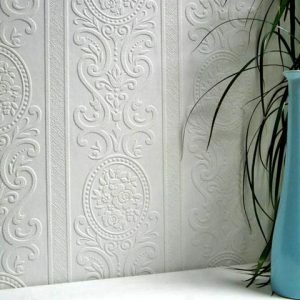 Embossed wallpaper hides wall flaws and unevenness. They can be used over slightly damaged walls, light cracks and other minor irregularities. They are easy to install, easy to remove and washable. A recent trend in wallpaper decorating, non-woven wallpapers are made of a blend of synthetic and natural fibres. They are therefore breathable and washable. These are already used in furnishings and upholstery and other products like teabags and gauze. This wallpaper is also good for kitchens and bathrooms because of their porosity. They are user friendly, ecofriendly, tear resistant and make for a quick installation. Since they don’t expand or contract much, this kind of wallpaper can be used for years. It can also be used as a base for painting. Glass fibers when woven and bonded together make for a very strong sheet material. They are stronger and provide additional reinforcement to the wall. Since they are made from non-toxic by-products such as dolomite, soda and lime, they are eco-sensitive too. This wallpaper is great to cover wall cracks, can be painted over several times once applied and is flame resistant, especially important in homes. The water resistant adhesive works against destruction by moisture, and its insulating properties stop mold growth. Fiberglass is extremely lightweight and robust and can be molded to any form and used in living rooms and bedrooms, as well as kitchens and bathrooms.